This entry was posted in Nature, Ozarks, Poems and tagged 17 syllables, american sentence, autumn, dVerse, frost, home, november sky, poetry, seasons, study in white by The Course of Our Seasons. Bookmark the permalink. Amazing frost painting photo, and I love your words. So finely woven together. Love a whitetail in profile! Very close to authentic haiku – completely natural, and beautifully wrought. Never tried cream in my morning tea – but sounds delightful – as are your words. 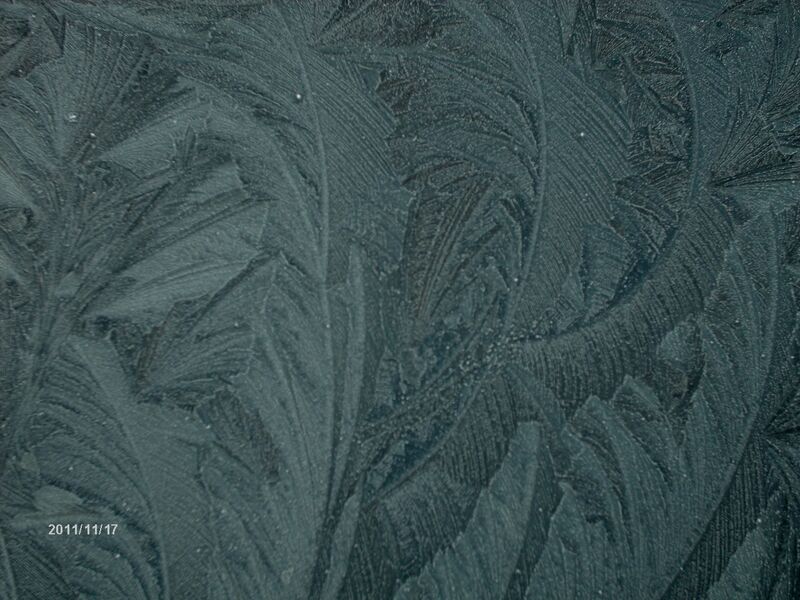 Lovely – is the photo of a frosted windshield? Wow, five beauties here, Kathleen; at first seemed like actual haiku masquerading as American non-haiku, but more than that; it shows your wonderful ability to work within form, and how you took the prompt outside the lines. I liked sentence/haiku #2 best. These are very beautiful – and very relatable. The image is also stunning. Beautiful lines, Kathleen! All very evocative. I particularly like “frost on windows/ clouds in the blue autumn sky/ cream in my morning tea”. These are wonderful pieces. It shows you have the skill to condense.. and whitetail the moonlight is a haiku masterpiece. Beautiful writing, Kathleen. Each of the sentences! My favorite is definitely the one about the ‘whitetail’ in moonlight. We have whitetails around here, very active in the early eve, and your poem resonated true with me.